Welcome to Week 3 of the Crochet Flower Challenge. This week we are making just the flower from Something Pretty Granny Square. First time here? 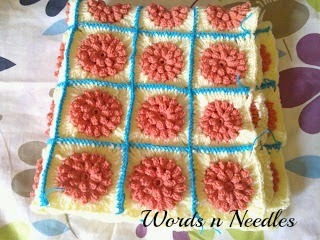 I am starting a new series here on Words n Needles for my crochet lovers! The challenge is to make a flower every week. 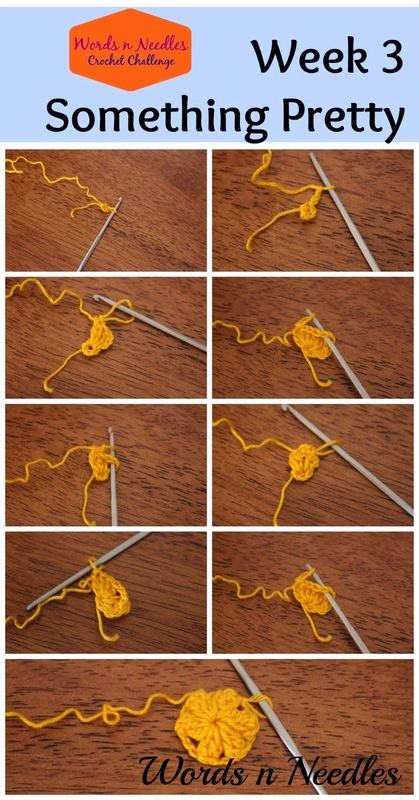 I will be sharing one simple crochet flower and it’s pattern every Wednesday. If you are interested in joining this challenge along with me, all you have to do is like us on Facebook and comment on the post for the challenge telling us that you want to play along. 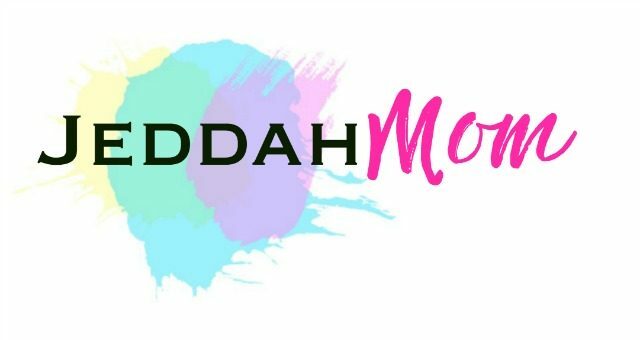 You don’t have to have a blog or an account and you are more than welcome to share your pictures or success on our page for our readers. I will share you too. I will also be pinning your image to my new Pinterest board on the topic. It makes me so happy when people crochet! Last week, for week 2 of the crochet challenge, we took a break to help promote and catch up on the past two flowers. This week we have another very addictive flower. It is so addictive that I made almost 50 of them in just two days! I made a throw pillow using this flower a few years ago for my son. Here is how you can make them too. The pattern to making the squares is here. So now, how do you make these pretty things? If this is your first time here, I recommend you hop over to our almost 50 of them in just two days and make the super simple chain stitch flowers for practice first. You can read our almost 50 of them in just two days If you need books and tools, almost 50 of them in just two days. Let us get started on this week. 2. Ch3 (for first dc), 3dc. Drop loop from hook. Take the needle inside out from the between the first 3. ch3 and dc and pull the dropped loop through. Follow with a ch3. 4. 4dc, drop loop from stitch and repeat like previous stitch by taking needle and inserting it between the first two dc and pulling the loop through it. Ch3. 5. Continue till you have 6 petals. Join to ch3 of beginning petal. You can leave it at this little flower or proceed to next row by following the same instructions as for row 1. This time though, you will be stitching two petals each over the ch3 inbetween the petals. There will be 12 petals in all. Again, you can leave it at this or you can crochet around it to make a coaster or you can join each to the other using simple granny squares and you will get this pattern here. You can also make it two different colours. You can use them individually to decorate other projects too. Joining the challenge for the first time? Here is where you can find more about it. Week 2 – The 5 Petal Flower. 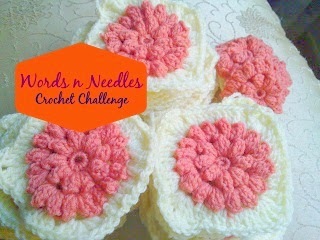 Interested in joining the Words n Needles Crochet Flower Challenge? Join us on our Facebook Page and share away! Follow Aysh Siddiqua’s board Words n Needles Crochet Challenge on Pinterest. Perhaps I will learn to crochet in 2015! These flowers look beautiful?